Fall has arrived and it's here to stay (for a few months anways)! This is by far my favorite time of year so I'm happy to see that it's finally here! The look I've put together is one of my favorite combos. I guess maybe I'm just not ready to let go of my jean shorts but I love mixing seasons a little bit! This outfit is perfect for days when the forecast is a little in between. 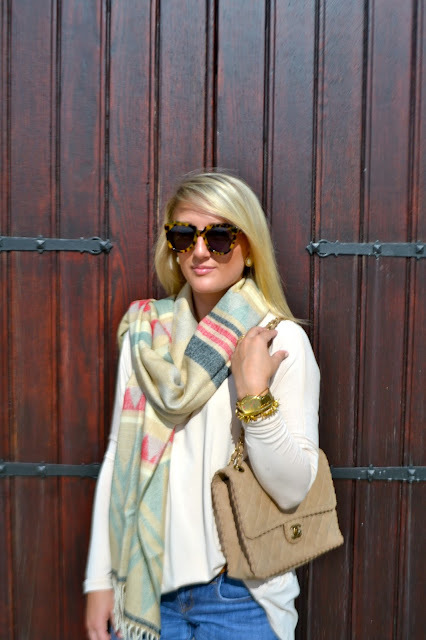 Adding a scarf during this time of year is a great way to add a little bit of style while also being conventional. If it ever gets too hot outside, this piece can easily be removed from the outfit allowing you to be a little more comfortable. I love having each and every one of you following along! I really like that scarf! I love to mix the seasons a bit too. Jean shorts with a lightweight sweater is one of my favorite combinations. Love your shoes soooo much!! So glad I stumbled onto this blog! Well thank you, Talia! That's so sweet. Happy to have you following along!